More of Markham’s plan gets revealed this week as Raylan’s investigation gathers pace. I’m really enjoying where this season of Justified is going so far. I’ve already mentioned recently that it feels like we really are being set up for a classic final season of the show. There wasn’t a whole lot of forward momentum here, and a couple of the stories were a little zany, but it all felt like it was leading somewhere. 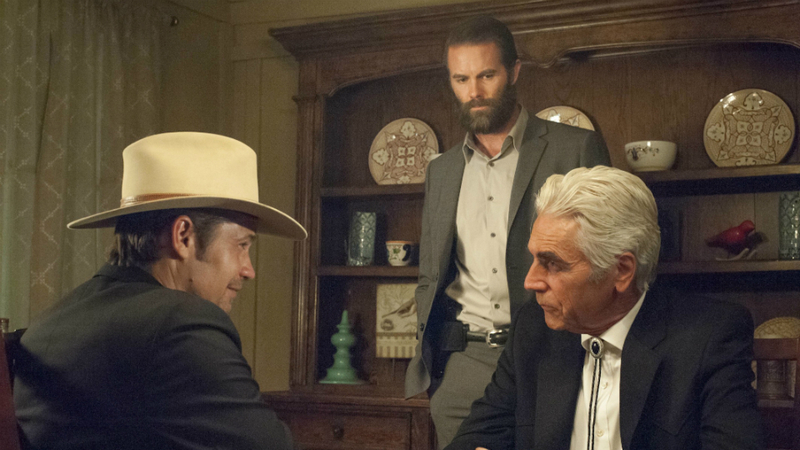 Raylan continued following the breadcrumbs this week, and they ended up leading him back to a few familiar faces. Seeing Dickie Bennett again was a delightful surprise, and Jeremy Davies brought all of his usual gusto to what will most likely be his final appearance on the show. Dickie hates Raylan more than anyone else in the world, so he took his opportunity to jerk Raylan around as much as possible. This all got turned on its head once Raylan figured out that Loretta had duped Dickie into selling his land to her. I must admit that I hadn’t even considered seeing Loretta again, but I’m glad we did. She has all the smarts to become another Mags if she wanted to, and the “apple pie” callback was wonderful. The first big Raylan and Markham scene didn’t disappoint. They faced each other down like two gunslingers, using words instead of bullets. Markham has been menacing without actually doing too much so far, and that only bodes well for when he does take action. He knew an awful lot about Raylan, including a nice callback to Tommy Bucks from the very first episode of the show. Each extra bit of information we get about Markham builds him up into an even more intimidating presence. So it turns out that the whole of this season rests on Markham’s plans to grow legal weed in Kentucky. I had been wondering why Markham needed all of this land, so it’s great to get an answer so early. A legal weed business is a hell of a dream for many of Harlan County’s inhabitants, a dream worth killing over. Ava enjoyed a strange, cocaine fuelled shoplifting adventure with Katherine Hale. Hale has been used sparingly so far, but she comes off as incredibly clever. Afterall, she is plotting to rob and murder her lover. Her little lunch and trip to the jewellery store with Ava was all about sussing out whether Ava was a rat or not. She surprised Ava in her room, got her to drop her guard and plied her with alcohol and drugs. After all that, she sprung the question about how Ava got out of prison. It was all very clever, and considering how Ava’s reaction wasn’t the most convincing, it wouldn’t surprise me if Hale has it all figured out already. Ava’s life is in continuous danger now, but it’s also definitely set up for her to be used as leverage against Boyd. Speaking of Boyd, his and Duffy’s plot was the most random by far. They went to visit an eccentric safe-cracker (played by Jake Busey) who could possibly help them out with their “pizza problem.” My first thoughts about the safe-cracker were that he seemed like a character out of Grand Theft Auto, and him accidentally getting blown to pieces in a hilarious fashion only strengthened that opinion. While Boyd remains no closer to cracking that safe, this was an excellent diversion. I found myself increasingly worried for Boyd by the end of the episode, as his talk of a happy ending for him and Ava just can’t go well. Not only is Ava informing on him, but his dream of becoming “The Legal Pot King of Kentucky” is just too far of a reach at this stage. This series has always seemed like it’s heading towards a bad ending for Boyd, and all this kind of talk makes that look like more of a possibility. Is Hale already on to Ava? It is clear that she has suspicions, but how much do you think she actually knows? Tweet your thoughts on this and the episode as a whole @OldSnake24 or leave your comments below. Also, be sure to follow us @YouNerded.